This book has 16 strategies to beat the casino by Dave Lessnau. Six of these are Craps strategies, since craps strategies have been my main focus the past 10 years. However, I have developed many other fantastic strategies, which I include. Three are Roulette strategies, and one of those can also be used against the game of Baccarat. Then we have strategies for Video Poker, and strategies for Slots. There are also strategies for the games of “Let It Ride”, “Caribbean Stud Poker”, “Pai Gow Poker”, “Sic Bo”, and “Three Card Poker”. Most people who play these newer games have no idea, which is the best way to play for best advantage. Now, you will be able to play like a professional by using the proper strategies. Last but not least, I even include “The Basics of Craps” for some of you who don’t fully understand the game. I have been marketing craps strategies since 1993, selling primarily my 6 to 1 Craps Strategy. I have over 7000 satisfied buyers of my craps strategies. Over the years I have developed many other systems besides the 6 to 1, and have decided to offer them as a compilation in my new book, Playing to Win. The cost of advertising and mailing has gone “through the roof,” so instead of selling this system by mail order, as I have done in the past, I am going to offer this new book as an E-Book that you can download and print out yourself, if you so desire. No progression and wins on hot or cold tables. No fear of dreaded 7. 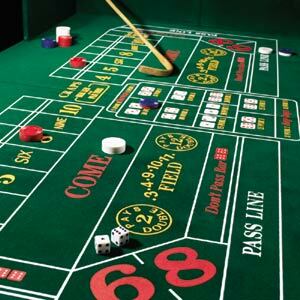 Probably the best way to play craps with a very low risk of loss. Small wins and losses, but wins most of the time. All numbers covered, even the 7. Great fun. Parlay system for the field. Huge wins possible. Positive progression on pass line play with medium risk and potential for major wins. If you hit a 6 or and 8 one time before three 7’s are rolled you win. Odds in your favor on every roll. Simplified strategy to return 99.5% to 100%. Can have an advantage over the casino. Wait a few spins or hands before making bet, and have odds way in your favor with this method. Wins 99.9% of the time. An excellent method for betting on a segment of the wheel. Several strategies for beating the slot machines. The best strategy of play to give you a winning chance against the house. This is for those that don’t fully understand the game of craps. All in all, this is a tremendous value, as the price is only $47.00. I can offer it at this low price because you must download it, thus I don’t have publishing and mailing expense. I will not have this available in hard copy. Playing to Win is packed with information you need to beat the casino. Any ONE of these, proven, tested and profitable systems could earn you a fortune! I am not going to lie to you. No one can guarantee you 100% success at gambling. However, I promise you this: You won't find a better collection of systems anywhere! What I can guarantee is your satisfaction. Test out the systems for the next 60 days on me! Integrate them into your casino play. If you are not 110% satisfied for ANY reason at all, or if you don’t agree Playing To Win is one of the best investments you have ever made, then let me know, and I will be happy to refund the price you paid. That’s more than a guarantee – that’s a promise! Now you can benefit from my years of successful research and experience for just a small investment in time and money. If you follow the instructions in this book, these clear, concise, low-risk, profitable systems will take you out of the red and into the black….. and KEEP you there! Remember, your satisfaction is guaranteed! You have nothing to lose and everything to gain by trying Playing to Win. To get started NOW, just click on the BUY NOW below to order on our secure server, and download your copy.